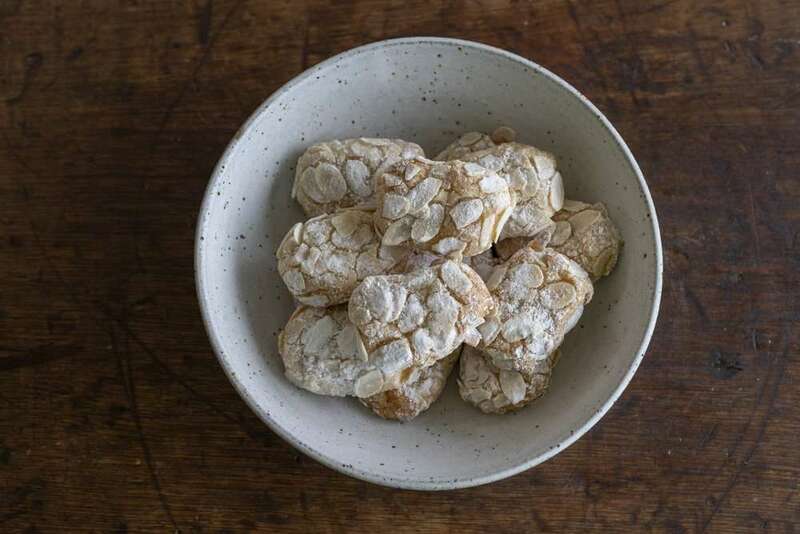 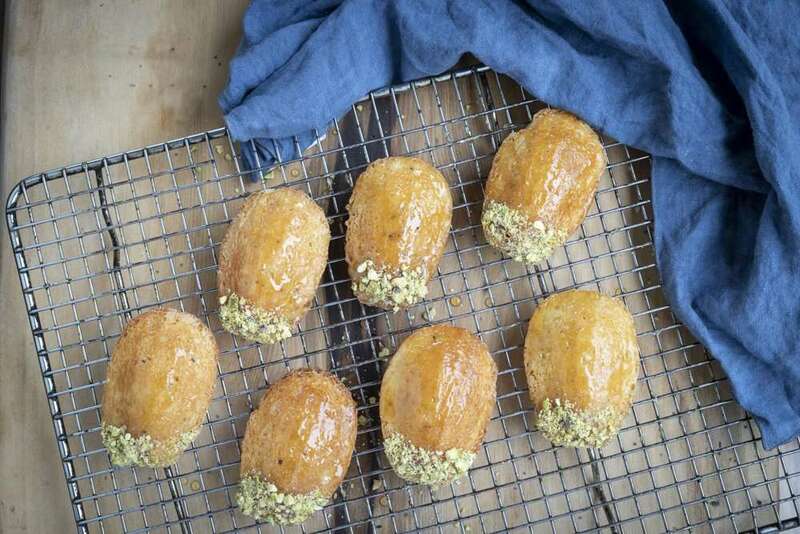 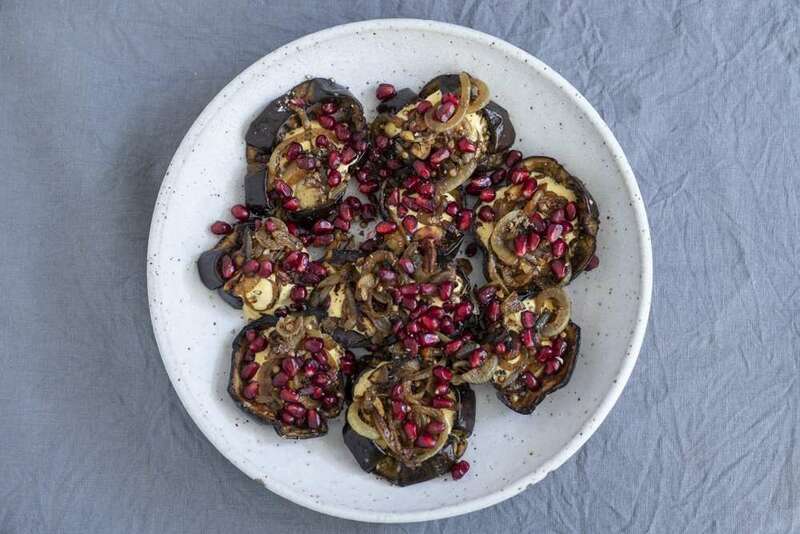 Yotam Ottolenghi is coming to Hobart on the 2nd of February, so I have decided to make as many of his recipes as I can until his Q & A session, where I can finally meet him. 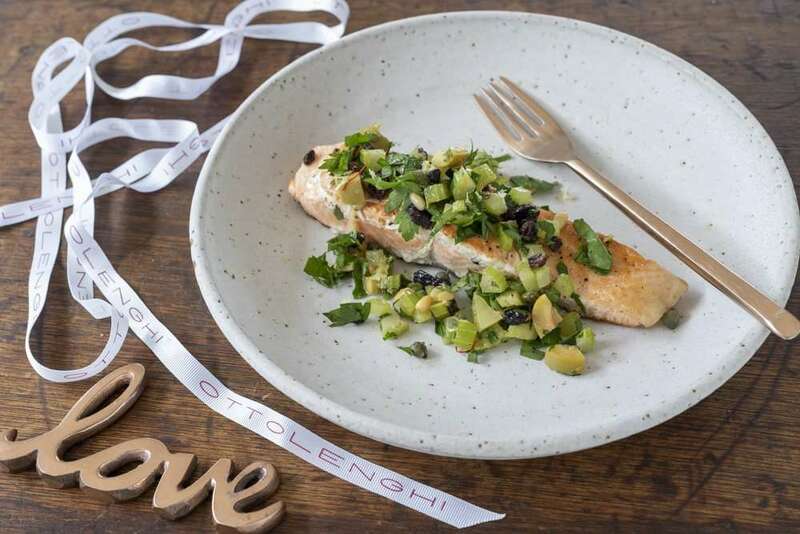 I was lucky enough to spend my birthday brunch at one of the Ottolenghi cafes last year when I visited London & was given a signed Sweet cookbook for my birthday, then for my last dinner in London I dined at Nopi, It was a very delicious & memorable experience so I bought the signed cookbook to bring home too. 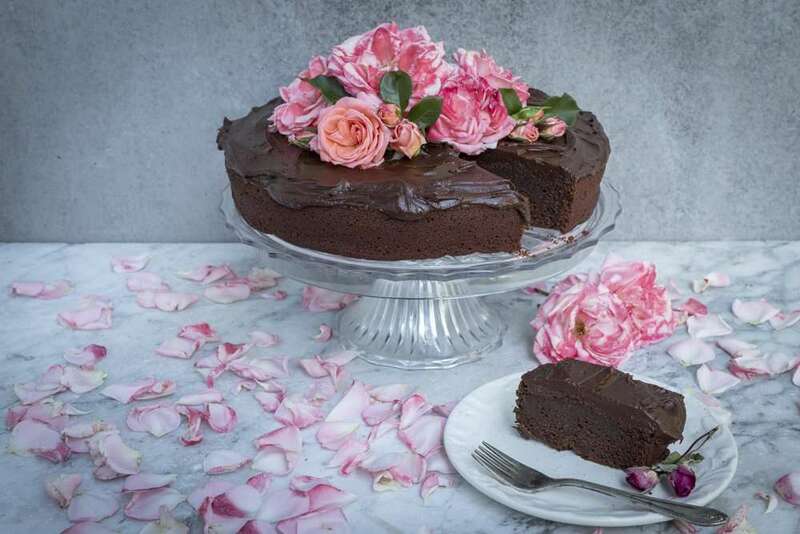 Take Home Chocolate Cake – Also known as The World’s Best Chocolate Cake from the Sweet cookbook. 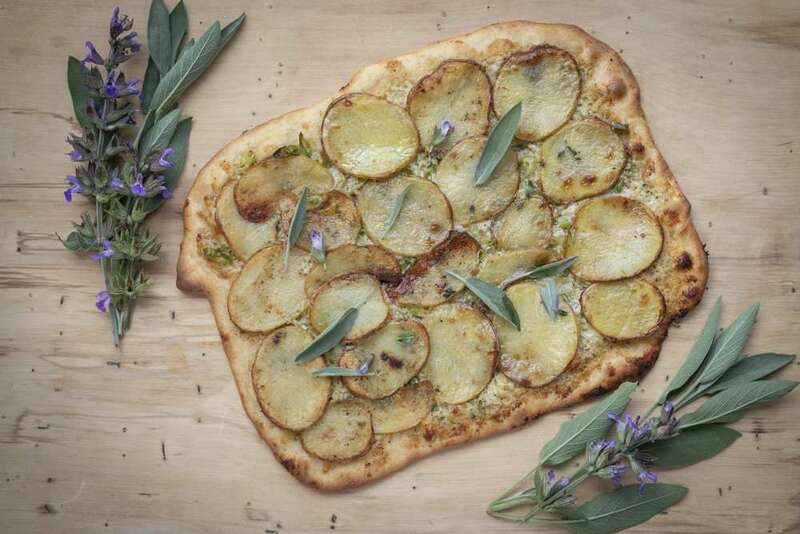 Pizza Bianca with Potato, Anchovy & Sage from the Simple cookbook. 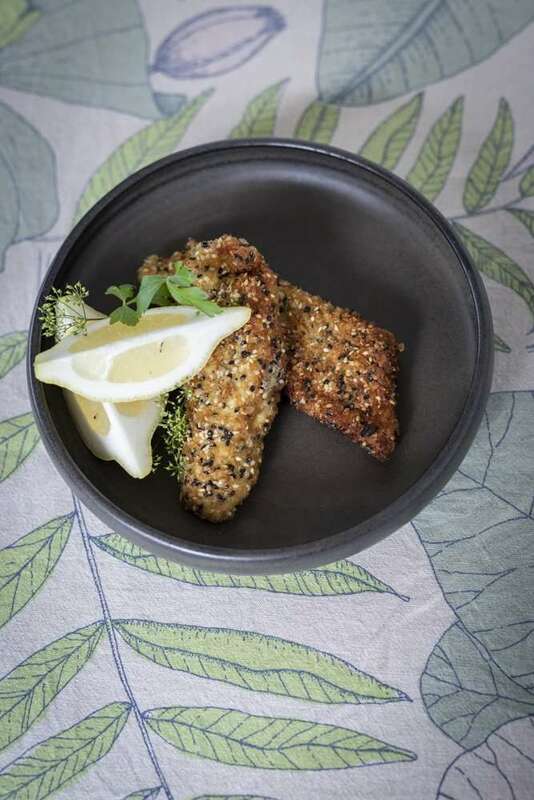 Seeded Chicken Schnitzel from the Simple cookbook. 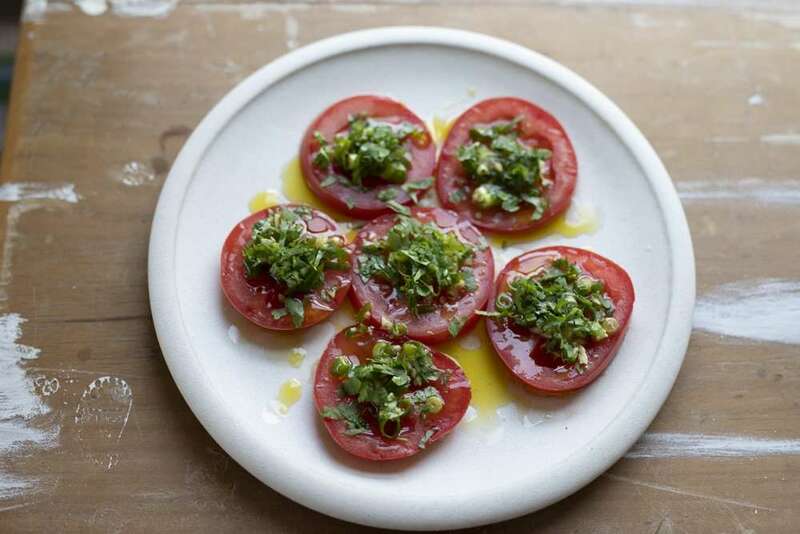 Tomato Carpaccio with Spring Onion & Ginger Salsa from the Simple cookbook. 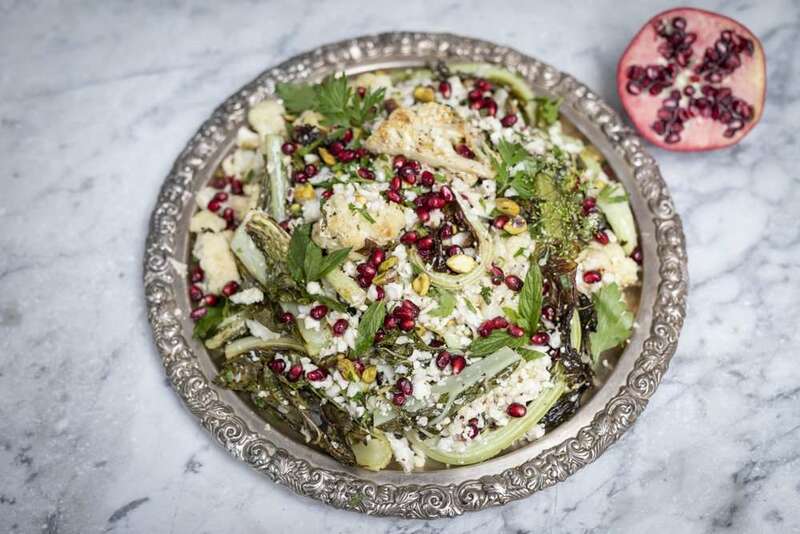 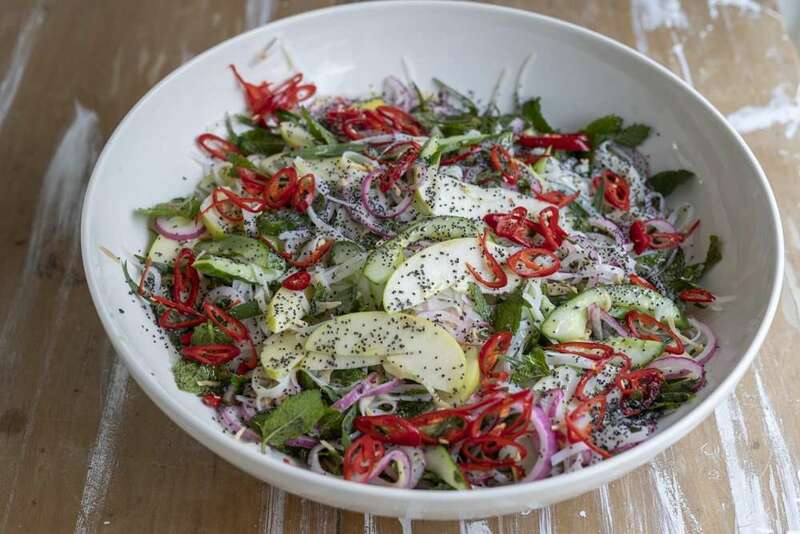 Cauliflower, Pomegranate and Pistachio Salad from the Simple cookbook. 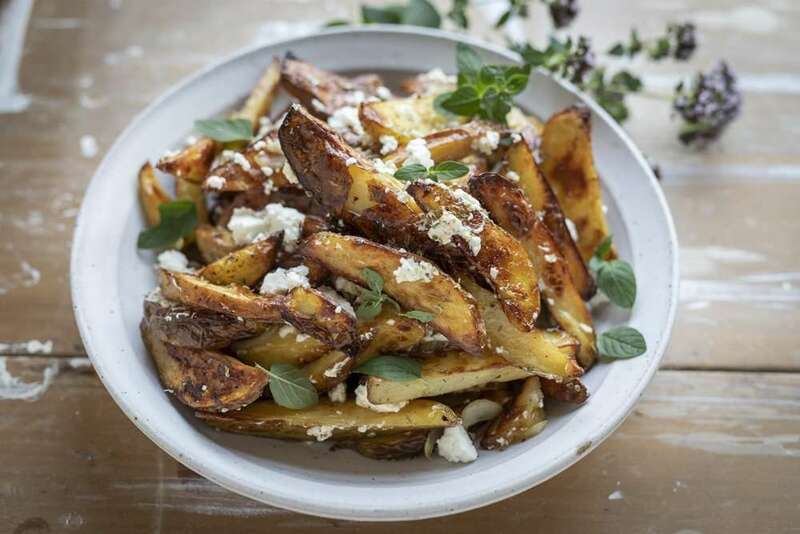 Oven Chips with Oregano and Feta from the Simple cookbook. 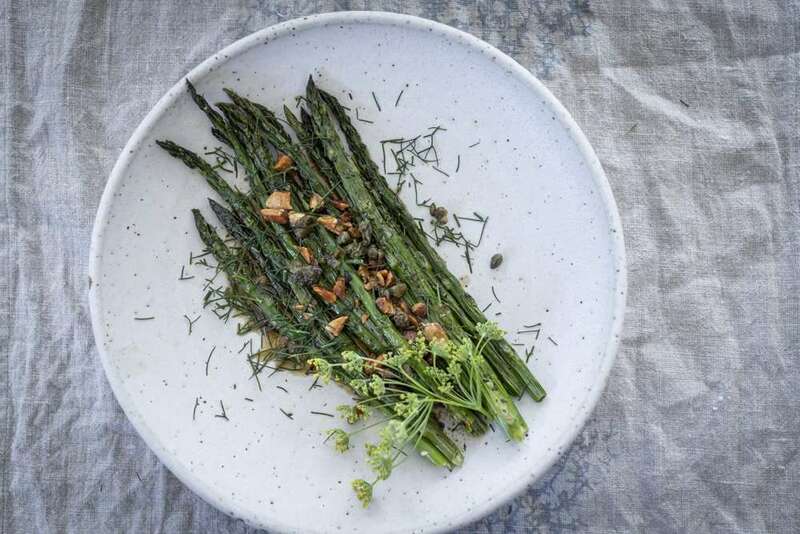 Roasted Asparagus with Almonds, Capers and Dill from the Simple cookbook. 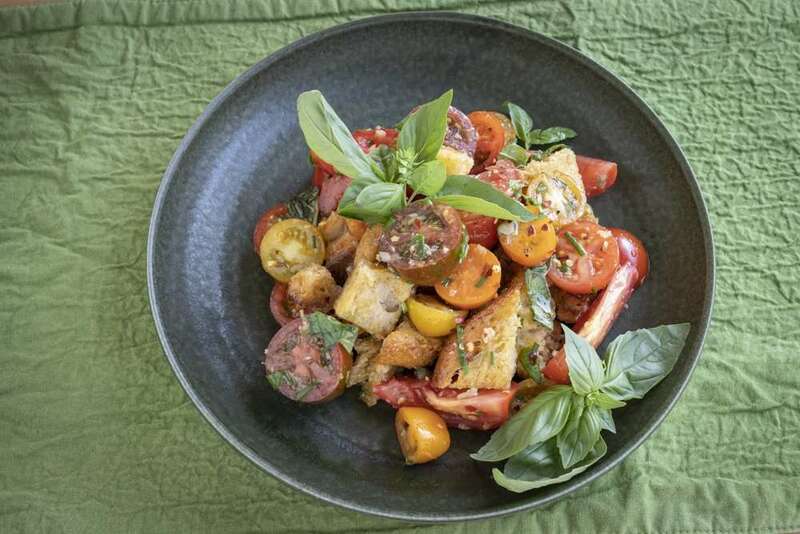 Tomato and Bread Salad with Anchovies and Capers from the Simple cookbook. 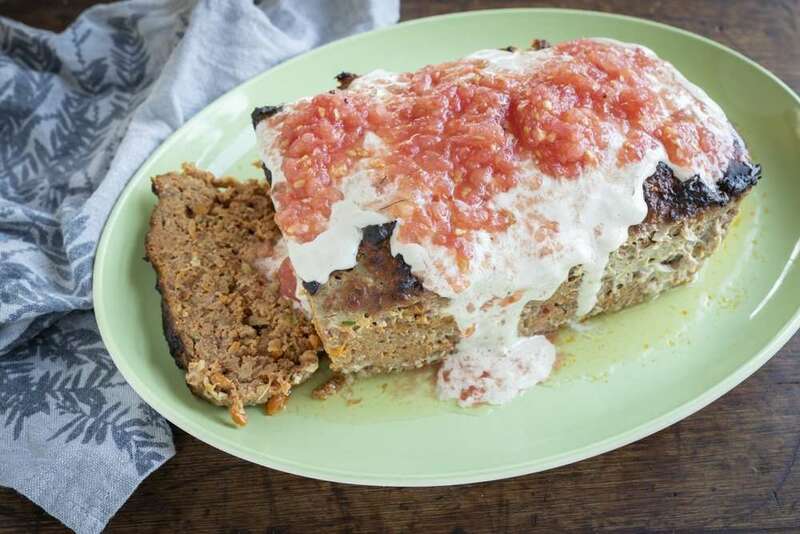 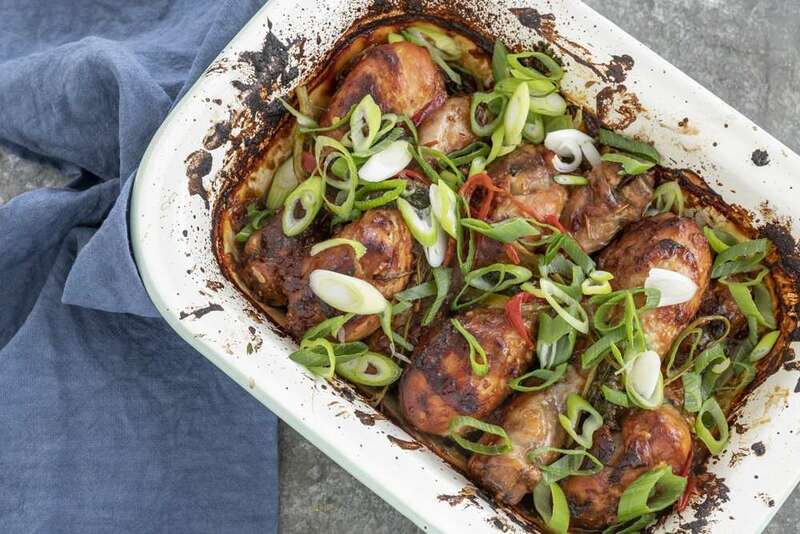 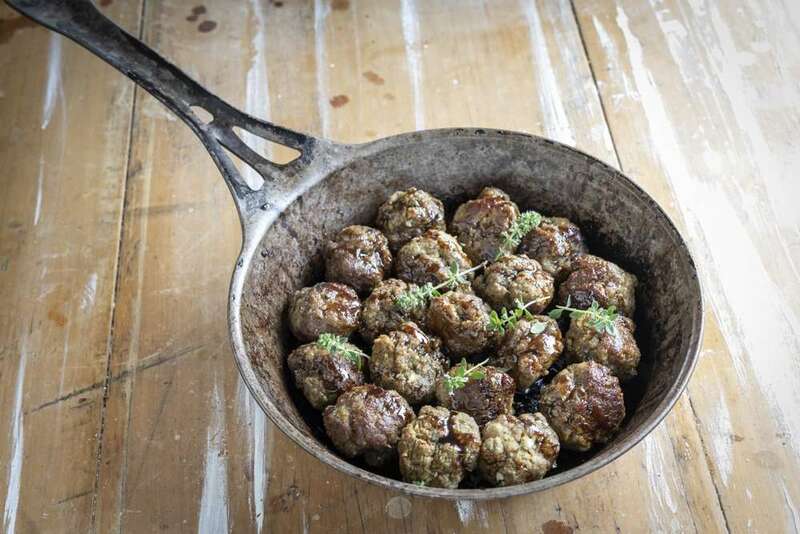 Lamb Bake with Tahini Sauce and Tomatoes – Recipe from the Simple cookbook. 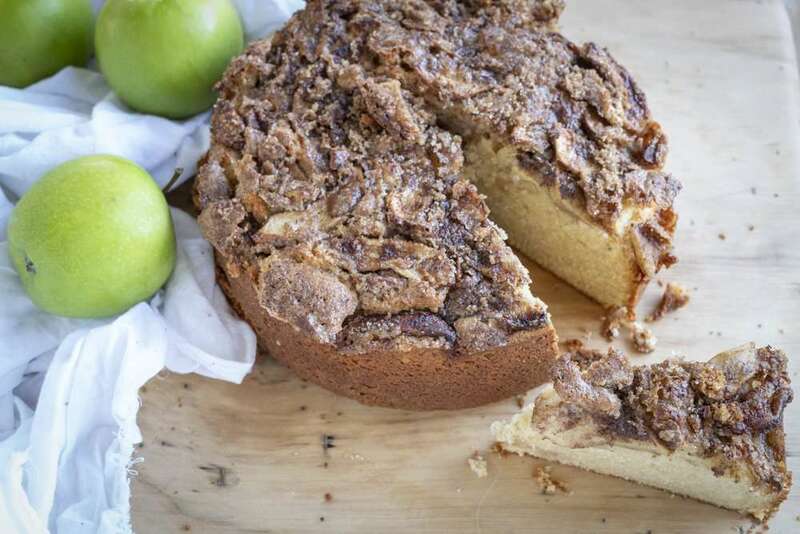 Spiced Apple Cake from the Simple cookbook. 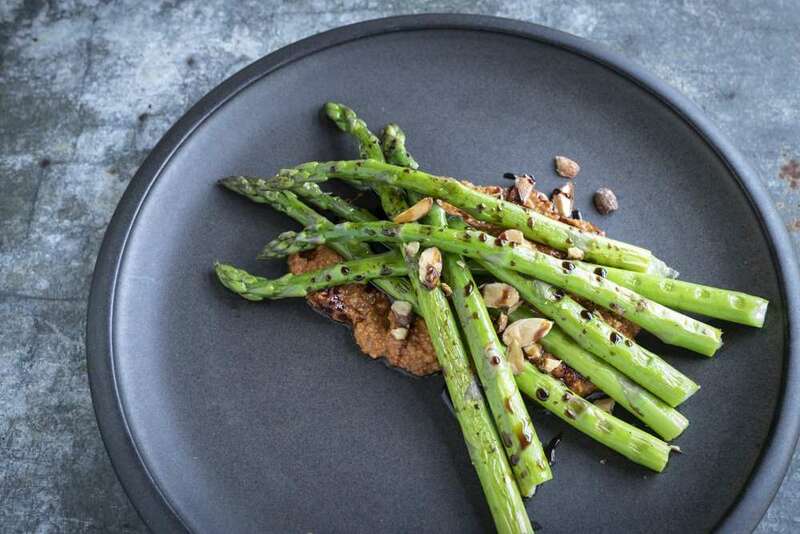 Chargrilled Asparagus with Romesco Sauce & Apple Balsamic from the Nopi cookbook. 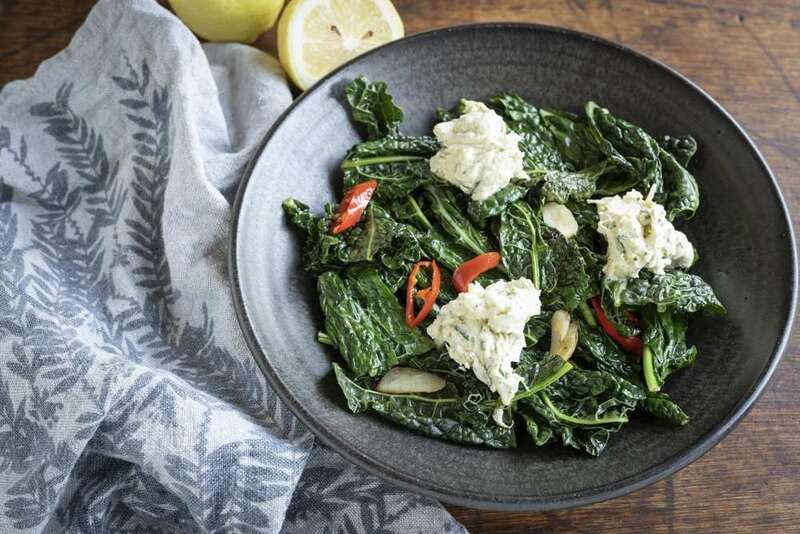 Burnt Spring Onion Dip with Kale (from my garden) from the Nopi cookbook. 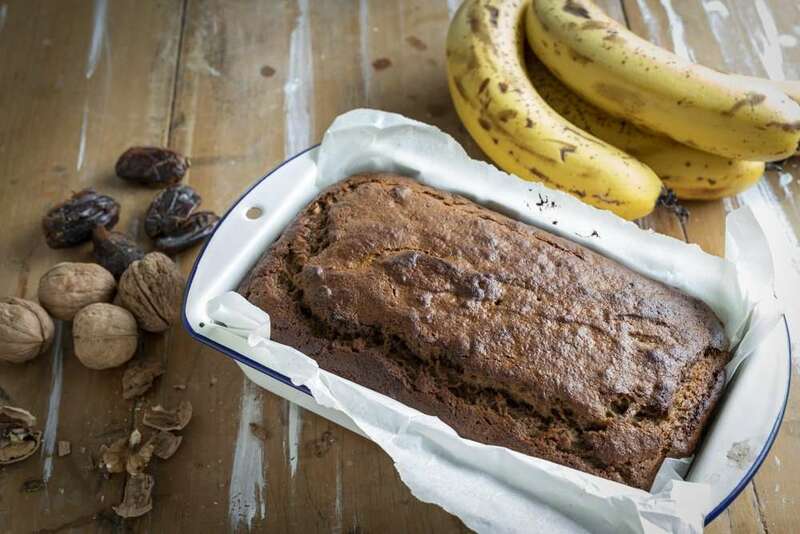 Banana Date and Walnut Loaf from the Sweet cookbook. 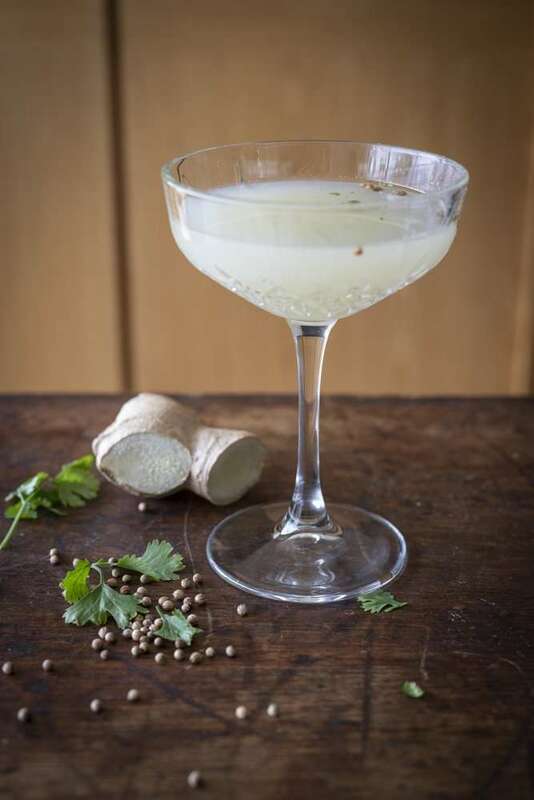 Coriander & Ginger Martini from the Nopi cookbook was the perfect way to start our Ottolenghi lunch I hosted for 6 of my friends on the 31st Jan. 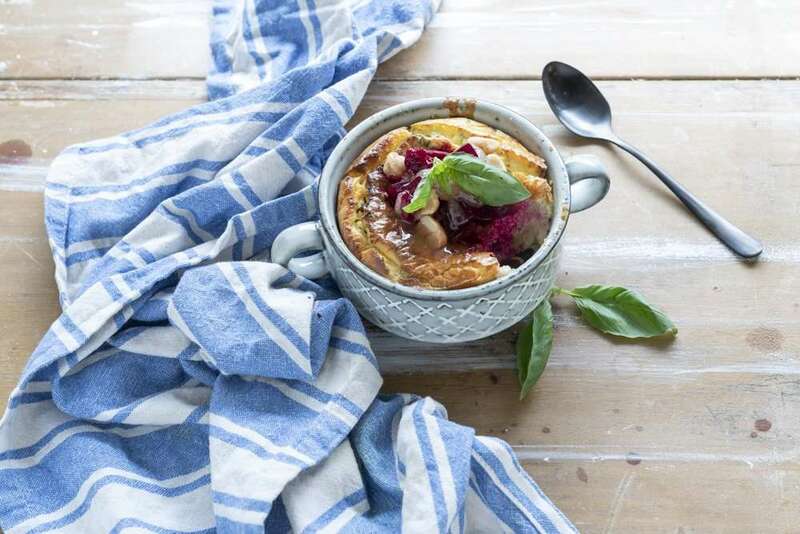 Baked Blue Cheesecakes with pickled beetroot & honey from the Nopi cookbook – it was the favourite dish for the lunch and just as yummy as I remember it from eating it at Nopi. 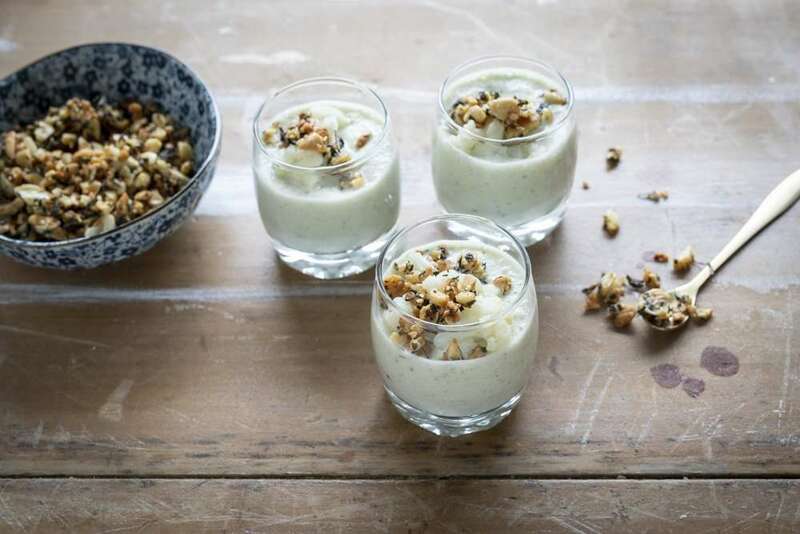 Chilled Cucumber, Cauliflower & Ginger Soup (made by Sue & styled by Natalie) from the Simple cookbook. 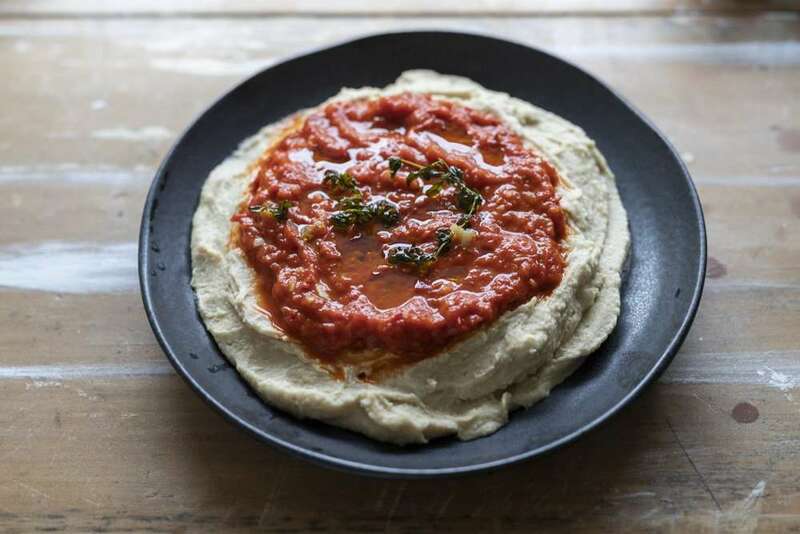 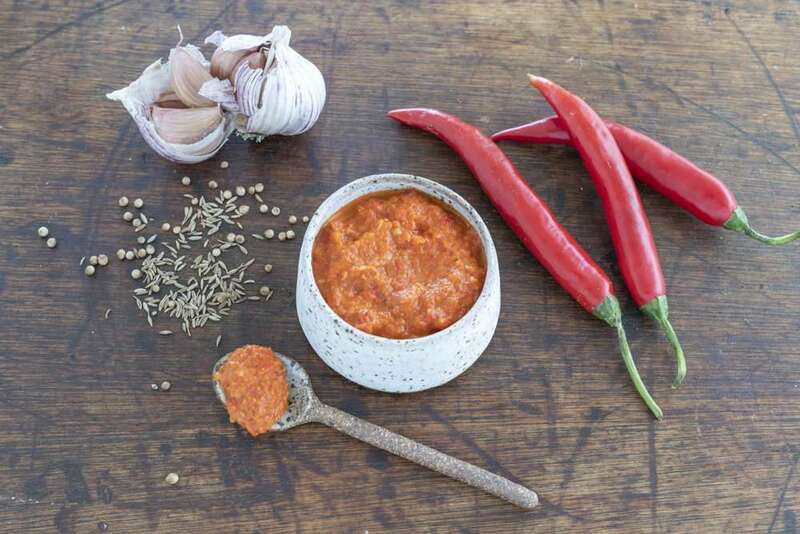 Butterbean Mash with Muhammara (made by Rosey) from the Simple cookbook. 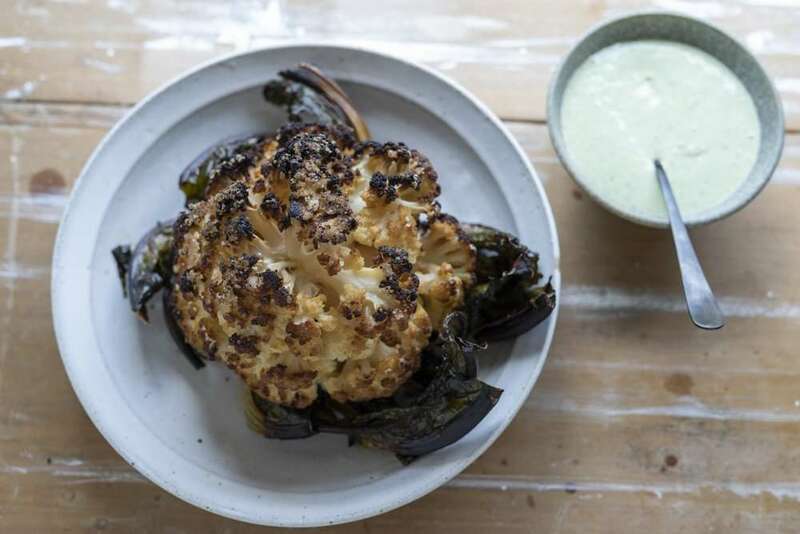 Roasted Whole Cauliflower with Green Tahini Sauce from the Simple cookbook. 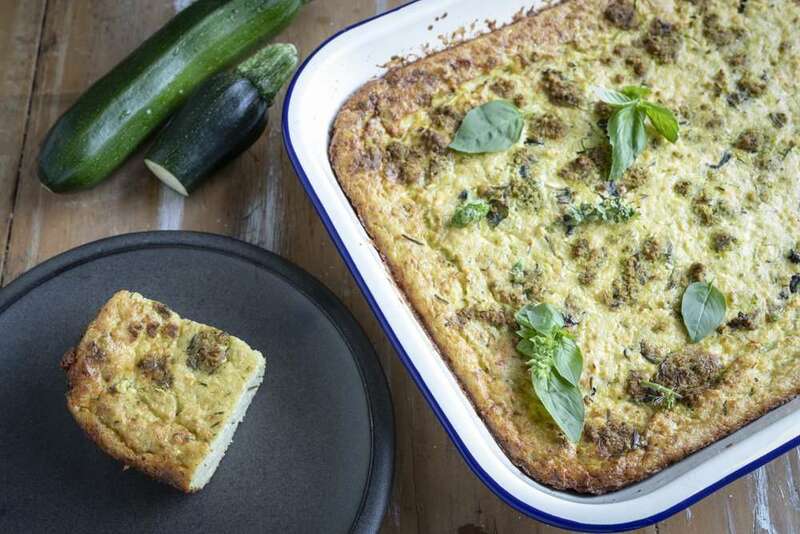 Cornbread with Cheddar, Feta & Jalapeño from the Simple cookbook. 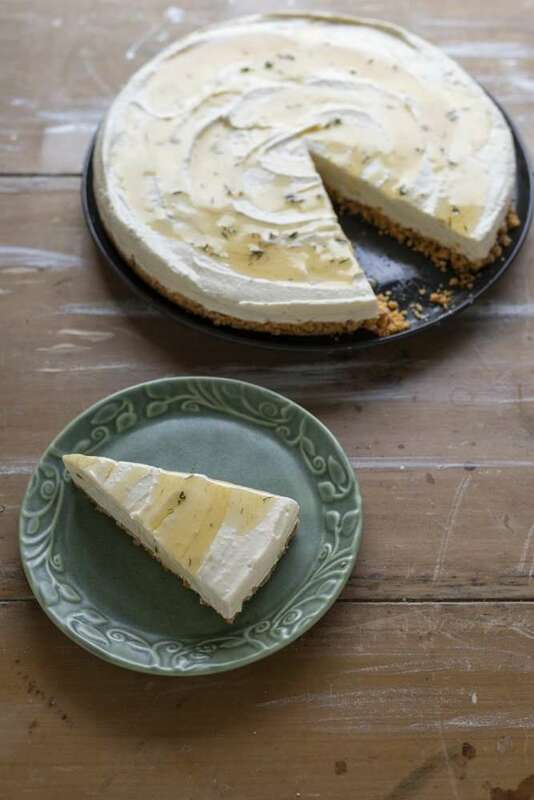 Honey & Yoghurt Set Cheesecake (made by Rosey) from the Simple cookbook. 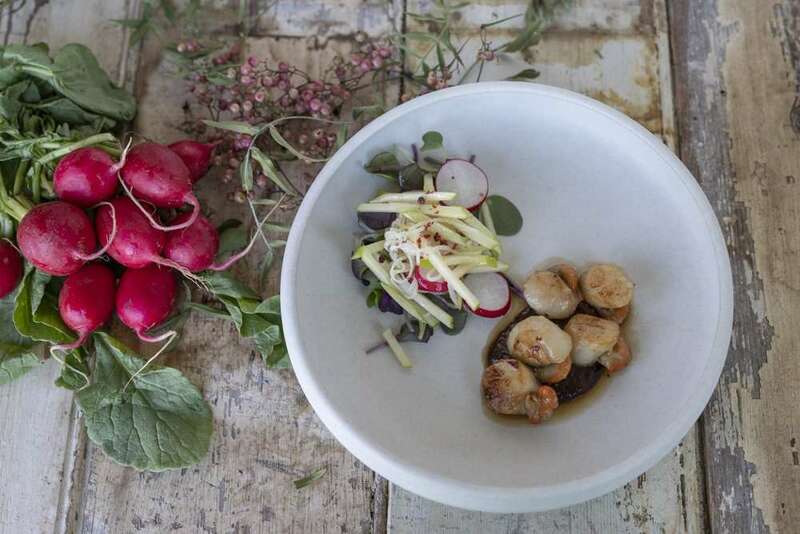 Seared Scallops with Pickled Daikon and Chilli Jam from the Nopi cookbook. 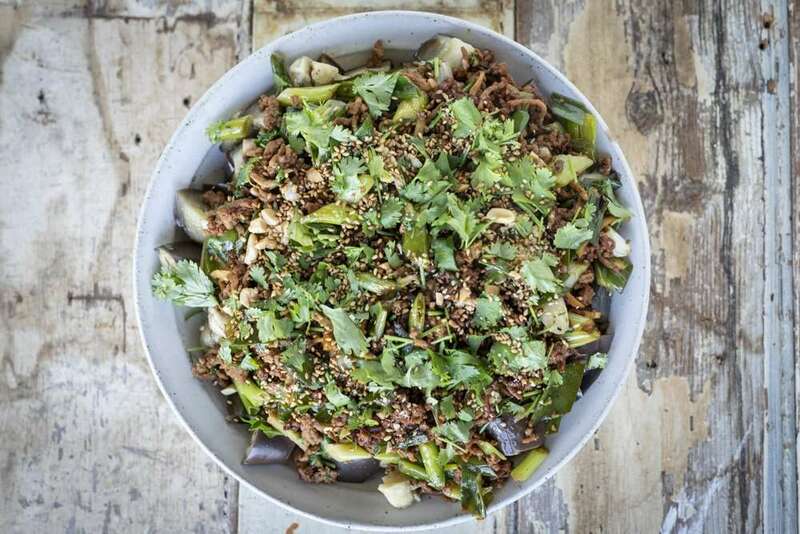 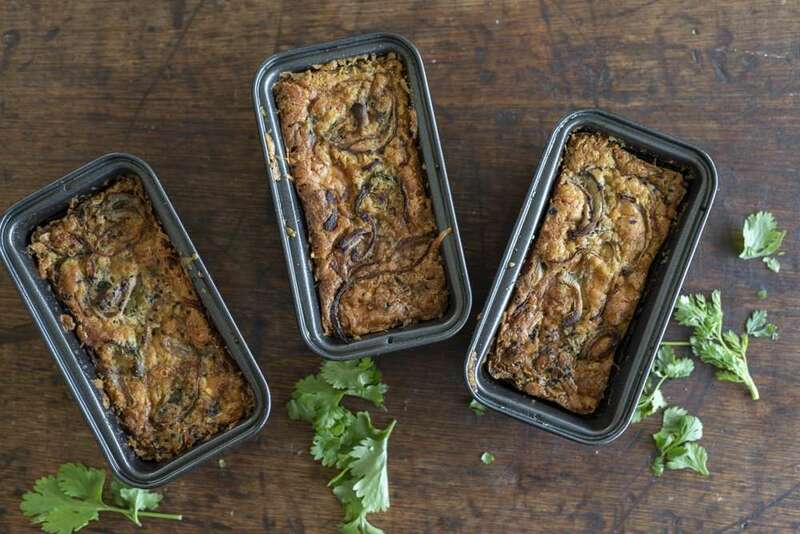 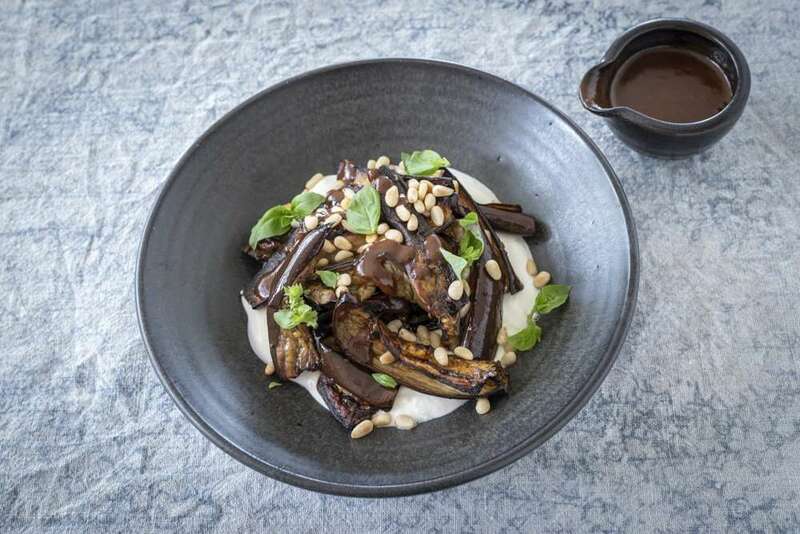 Roasted Aubergine with Curried Yoghurt from the Simple cookbook. 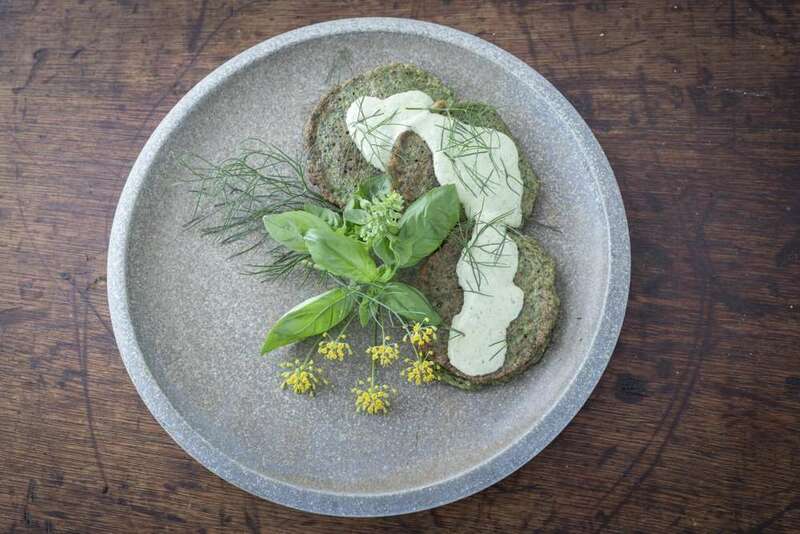 Iranian Herb Fritters from the Simple cookbook. 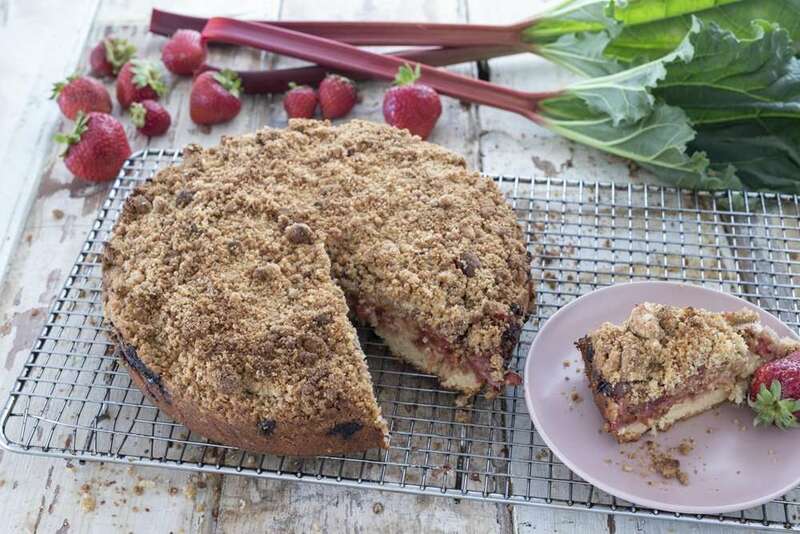 Rhubarb and Strawberry Crumble Cake from the Sweet cookbook.